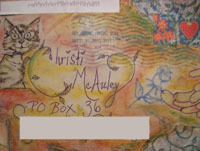 I originally joined for the mail art, well recently there has been a lack of mail art swaps so I decided to host my own. What is mail art? Anything and everything that has to do with the decoration of the envelope. To clarify, this swap is more about the outside then it is about what's inside. Don't leave the envelope empty though!! Send a letter, stickers, scrap booking materials, a bookmark or just a smiley face. As for the outside this can be any medium you feel like. A doodle, collage, paint, ect. Be creative! Also check out your partner's profile page to see what sorts of things they like. Now partners receiving, try not to be too picky. If your partner put effort into the mail art please rate fairly. You get 1 partner. You can use any size envelope, just nothing smaller than: 4 1/2 x 5 1/2". I will angel if your partner flakes. NEWBIES ALLOWED with a filled out profile. No one with a rating below 4.5. No unexplained 1's. Please explain 3's but not required. What are you considering larger than a standard card size? The USA size for a 4 1/2 x 5 1/2" card? Thanks for asking that question, rereading it I realized that was very unclear, I was more worried about people going smaller than a standard card size. But anything 4 1/2 x 5 1/2 or larger is fine. Just nothing smaller. I would consider this a type 3, as slot of effort goes in to this. I already finished mine, I was so excited! I am new to mailart but am willing to give it a shot,I hope my partner will like it, any good books out there that has creative ideas? Thanks for letting me join.